A female northern fur seal nurses her pup. Photo by D. Costa. The study will be published in the Proceedings of the National Academy of Sciences (online Early Edition, May 21 to 25, and in a later print edition). 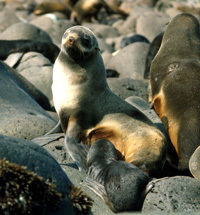 The long-term maternal strategy, seen in sea lions and most other eared seals, is believed to be driven by periodic disruptions of temperate marine ecosystems, such as El Niño events, he said. A shortage of food during an El Niño could mean death for newly weaned seal pups, but species with the flexibility to continue nursing for longer than one year can keep their pups alive. "It's an incredible behavioral change over time--there is no modern population of northern fur seals that does what these animals did in the past," Koch said. "So where is it natural for this animal to be? Has the species lost the behavioral diversity it needs to be successful here in California, or is it possible for them to reevolve that capacity?" "We think now of sea lions, harbor seals, and elephant seals as the natural inhabitants of the California coast. But how did those species interact with fur seals, and how did the ecosystem work in the past when fur seals were more abundant? We still don't know what it was like, but I suspect California was really different when these animals were here in the past," Koch said. This research was supported by funding from the National Science Foundation and student research grants from the Myers Oceanographic and Marine Biology Trust, Long Marine Laboratory, and the PADI Foundation. Notes to reporters: You may contact Newsome at (202) 478-8987 or snewsome@ciw.edu; Gifford-Gonzalez at (831) 459-2633 or dianegg@ucsc.edu; Koch at (831) 459-5861 or pkoch@pmc.ucsc.edu; and Costa at costa@biology.ucsc.edu.